Dinner was great, baked halibut w/ herbs; baked acorn squash and spuds, bread and pumpkin pie. Pretty well filled the oven. 2:15 light fire with lots of 1×3 and 1×1 size material (7-8 of the 1×3). dark smoke, creosote smells. tried putting on the oven door, but the smoke got worse. 2:45 clear smoke, finally got all that wood burning well. Door propped ajar, coals are white hot. Should have started with 1/2 the amount of wood until the oven started to warm. 2:55 soot burning off the inside of the oven, added 3 pieces of wood 2.5″ diameter and 14″ One piece proved to be green and hissed for 15 minutes. 5:10 put in fish, pie, spuds and squash. Bread shaped but still rising. 5:20 bread in, 400 degrees. Oven is steaming from roof, chimney and door. Start with a smaller fire to begin warming the oven, adding wood incrementally. Stop adding wood more than an hour before oven is ready, the white hot coals will continue to heat the oven for quite a while. Get a Weber grill to catch the hot coals, plan food to BBQ on the grill while the oven is baking. Have a plan for what to do with a hot oven when the baking is finished. At 10PM oven is still 225. Crackers? Slow cooked roast? Much as I discovered some of the vertical integration that comes from hewing timber and doing timber frame joinery for building (in terms of the by-product scraps), and in a similar vein, the vertical integration of using scraps from my sawmill for heating, I can see that there are integrations to be made with this kind of small-wood burner, the size wood the oven burns is a size I’ve always thought was too small to be useful – which is important to note. There are also integrations to be made among the kinds and timing of foods that are cooked in the oven. Were the oven in an enclosed space the waste heat would also be significant for heating. Waste heat in the flue might be used to warm water, though my current design would require a pump to move the water up to the chimney and back. I was just sitting down to write notes about the earthen oven I made this weekend when I found this from a friend. natural architecture – an emerging art movement that is exploring mankind’s desire to reconnect to the earth, through the built environment. Very interesting stuff, fits with my continuing thinking about making my architecture more organic. 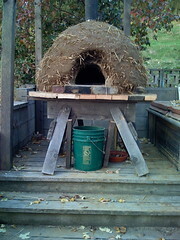 I built the oven following Build Your Own Earth Oven by Kiko Denzer which was good guide. I followed one of his tips for people in a hurry and built it on saw horses (knowing it will eventually burn thru). This is a temporary location anyway, while I decide where it goes. The tip to roll the mix on a tarp is also a good one. I put clay and sand on the tarp in layers, tossed it a bit with a shovel, then began the tarp technique. As Kiko warns, adding more mix to dry out a wet batch is hard work (next time I’d premix the stuff to be added). Since one location for my permanent oven could be in an enclosed sun space (might it provide heating too?) I wanted to try a design with a rear chimney to keep the smoke out of the room. First small firing today was very smoke free. 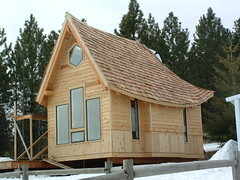 By 9PM the fire was out and the top was steaming in the moonlight (its going to be frosty tonight). The platform is 45 deep and 37 wide. Next time, I need to make the base a bit wider and quite a bit deeper. I got most of the chimney onto the base, but didn’t have enough depth behind it to encase the chimney in cob. It would be nice to have a bigger hearth too. I can see I’m going to want a work surface near the stove and a hearth could have been part of that. The void of the oven is 27″ diameter and 21″ tall. Kiko says the door should be taller, but I think that is for ovens without chimneys, mine draws very well. I started our buying 1/3 yard of finishing sand, but that was not enough to fashion the void and make the first layer. Another 1/3 yard provided some leftover before emptying the void. My clay came from a construction site near the Pullman airport, and it dried into a nice hard brick. I mixed it 1-3 with sand for the inner layer and 1-2 for the cob layer. All told, I probably used 8 5-gallon buckets of clay. I was a little worried that the inner layer was too sandy, but a patty dried overnight by the wood stove passed Kiko’s ‘crushing between thumbs’ test. I did not put a slip clay layer on, that seemed like extra weight and work for a temporary oven and I’m starting to like the hairy straw look. As it is late October, I decided not to wait for the oven to air dry and built a small fire for several hours. Flames roared up the 6″ diameter chimney and I think I’ll put a brick inside to cover part of the opening. The chimney will get a metal damper next. The oven is a great consumer of fuel, I tossed in all manner of scrap lying around — too small to be candidate for kindling in our heat stove, too big to be mulch. Other than the tired back from all the stooping, very satisfying so far.